Just take a look at that image above and you’ll get a feel for what Nintendo could be packing into its next home console/portable hybrid. Keep in mind that nothing here is set in stone, but it looks like Nintendo could be planning a controller that is almost 100 percent touchscreen for the NX. Outside of a couple of shoulder buttons, it looks like this miniscule controller relies entirely on the kind of input you typically get out of a smartphone. The original patent is a long, dry read, but it’s available for those of you who are into that sort of thing. It also includes more detailed images of the blueprint, but you can see pretty much everything you need to see in the image above. 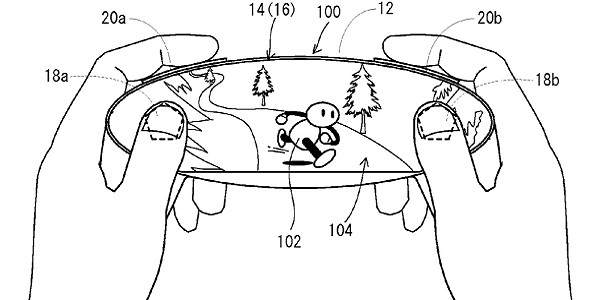 It’s not uncommon for Nintendo, Microsoft and Sony to file these types of patents when they’re working on new projects. Sometimes they make it to production and sometimes they’re just ideas that never actually see the light of day. One thing is for sure, though, this weird little controller certainly matches up with what little Nintendo has hinted at about its next console, as well as the current plans for the future of the company. Nintendo has always been about breaking molds, especially when it comes to its controllers. The 64’s pad broke from an industry norm that Nintendo itself helped to create, and since then, nothing about Nintendo controllers has been what you might call “normal.” The Wii waggle wand took a lot of folks by surprise, as did the Wii U’s massive tablet-esque controller. Even the portable DS and 3DS baffled gamers at first. Most of the time, though, Nintendo’s bizarre way of thinking has worked out, making for some pretty creative ways to interact with games. Nintendo has stated a few times that the 3DS is a part of the company’s plan for the foreseeable future, but they’ve also promised that the NX will be different and somehow bridge the gap between home and portable gaming. The controller seen in this patent certainly seems to fit that mold. You could use it in tangent with a box plugged into your TV and, due to its size and lack of buttons, throw it in your pocket for gaming on the go. There’s also the fact that Nintendo is pushing into the mobile market these days, with bigger plans expected to kick off in that space come 2016. It makes perfect sense that Nintendo would create a game console that can play those mobile games alongside more core offerings and, again, that seems to match up perfectly with the design of this new controller. Like with everything concerning the NX, though, we’ll just have to wait and see.